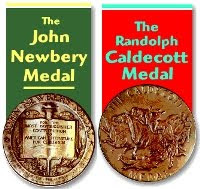 Caroline Bookbinder: Newbery and Caldecott Medalists announced! The announcement, according to Publishers Weekly, is this: "Rebecca Stead has won the 2010 Newbery Medal for When You Reach Me (Random/Wendy Lamb). Jerry Pinkney has won the 2010 Randolph Caldecott Medal for The Lion & the Mouse (Little, Brown). And Libba Bray has won the 2010 Michael L. Printz Award for Going Bovine (Delacorte)." During my rereading binge in December, I found it very shocking to note that these prizes didn't seem like such a big deal in the '70s and '80s. My copy of Island of the Blue Dolphins had a single sentence at the top, in small print, noting that it won the Newbery. No medal on the book. No starburst. The same with Abel’s Island (1977 honor) and A Wrinkle in Time (1963 winner)and Jacob Have I Loved (1981 winner). I wonder why? It’s not like the awards were so new at that time that people didn’t know if they’d stand the test of time (first Newbery winner: 1922 The Story of Mankind by Hendrik Willem van Loon). It wasn’t like parents had more time then to peruse bookstore and library shelves with their children to pick out good books. Most likely it was simply that children’s book marketing was still in its infancy. I’m very glad though that the high standard of these awards have been recognized. When my non-bookish friends tell me they don’t like all the books they’ve gotten for their children, how they hate to read certain ones aloud, how they don’t know what to pick out so they just get the licensed stuff, I gently steer them to those pretty medals, point out that every bookstore worth shopping it has a display of Caldecott winners and honorees (Newberys are often shelved within the appropriate section), and all they have to do to be confident of an excellent book is look for that gold or silver circle. I have given as gifts Knuffle Bunny (2005 honor), Click, Clack, Moo (2001 honor), No David! (1999 honor), Owen (1994 honor), Sylvester and the Magic Pebble (1970 winner), and The Little House (1943 winner). The current edition of Sylvester even has the text of William Steig's Caldecott acceptance speech, which is very sweet and amusing. And much to my amusement as I look through the list, I see most of the books in my house that my sisters and I loved were actually Caldecotts from the ‘50s (Anatole, Madeline’s Rescue, Journey Cake Ho, One Morning in Maine), which means my mother bought us her favorites from her childhood. So congratulations to these new favorites, destined to long, happy lives in the bookcases of thousands of children. That's what makes libraries so great. You're right, a lot of the great old books are now OP, but you can find them at libraries. Kids don't care what the copyright date on books is, they just like a good story. And it's fun to read from a variety of time periods, you get a lot of different perspectives! One of my favorites is Margaret Wise Brown. Everyone loves Goodnight Moon, but A Child's Goodnight Book surpassed it as my favorite when I was given it as a shower gift. The Little Fur Family is also great. Do you have A Child's Good Morning Book?